When Jenny Bakery arrived in Singapore, everyone went crazy. We see queues forming early in the morning despite the heat and haze outside. 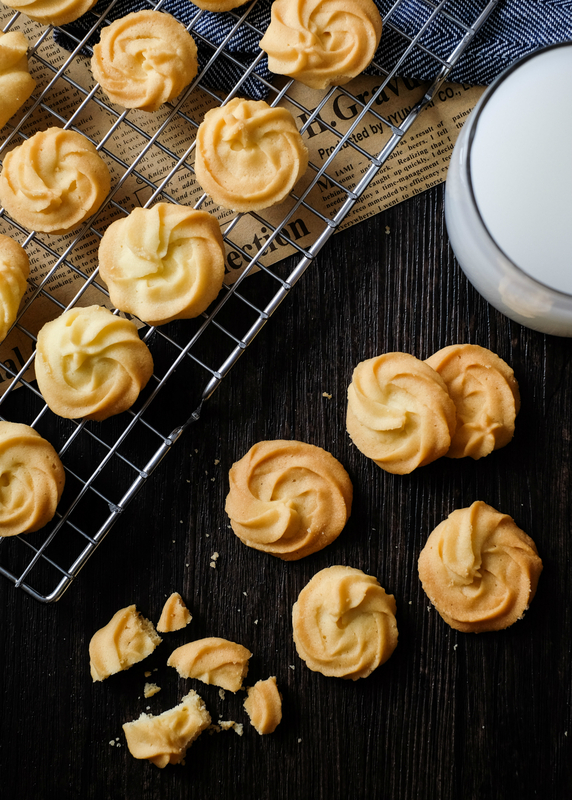 This Hong Kong’s cookie shop is famous for its butter and coffee cookies which draw long queues in Hong Kong and are so popular that a black market has sprung up with resellers offering the cookies at rocket high prices. I got a little crazy over it too. Because it’s almost impossible to get the cookies in Hong Kong nor in Singapore (unless you queue for hours). 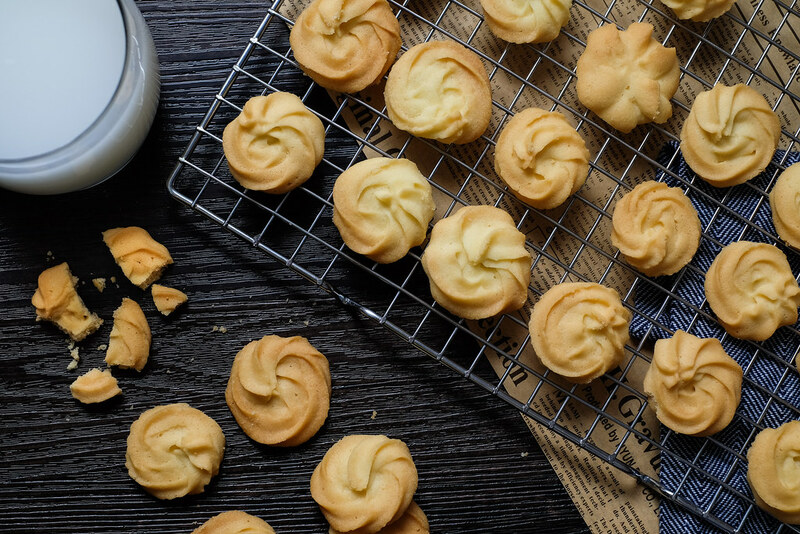 So I went online to google for butter cookies recipe, hoping to bake some for my own consumption. Shockingly, I found that many avid bakers have been coming up with recipes that tastes VERY SIMILAR to Jenny’s biscuits! In my house, we experimented with three different recipes and conducted a blind test in the family. The first recipe, we used 125g butter, 55g caster sugar, 32ml milk, 126g cake flour and 60g rice flour. It turned out hard and we had to dip it into our drinks to soften it. The second recipe, we used 200g butter, 50g caster sugar, 75g all-purpose flour, 75g bread flour and 50g corn starch. It was not bad, a little bit of bite but didn’t exactly melt in the mouth. The third time, we substituted all-purpose flour to top flour (wheat flour) and it was softer but I think can be better. After experimenting it again last night fine tuning the recipe, we are very happy. When you placed our butter cookies in the mouth, IT MELTS LITERALLY. Like you don’t even have to bite it. 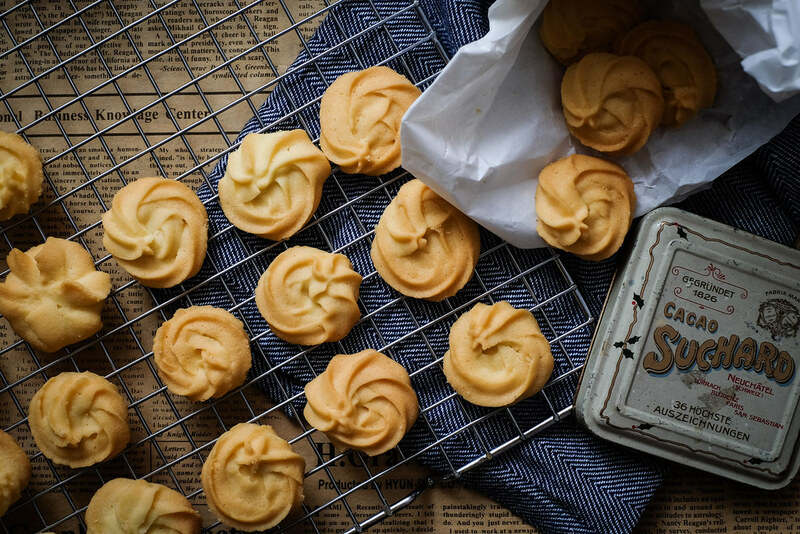 And the use of Golden Churn Tin Butter brings so much fragrance to the cookies. Let me remind you to sift the flour because it is much lighter than unsifted flour and aerates it at the same time, hence making the cookies airy and delicate. I really love it and we already have plans to bake more of it and give it as Christmas presents for our friends! Presenting to you…. 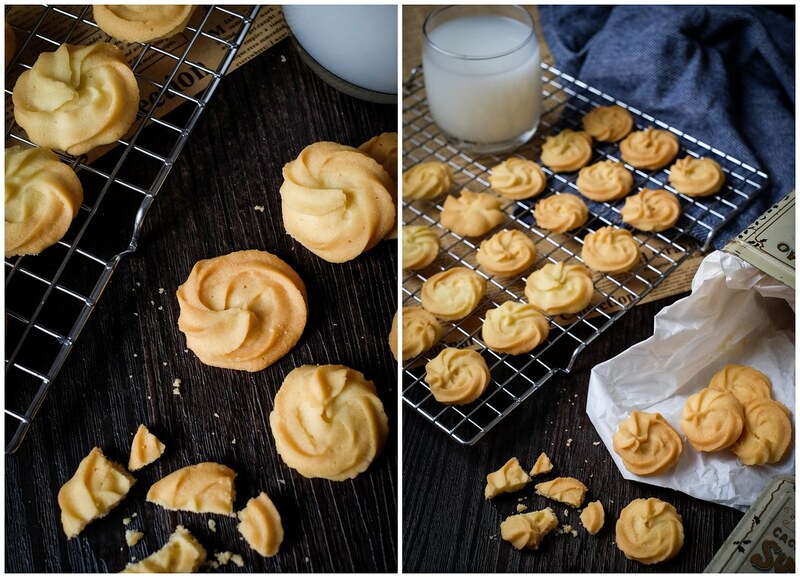 THE ULTIMATE BUTTER COOKIES! 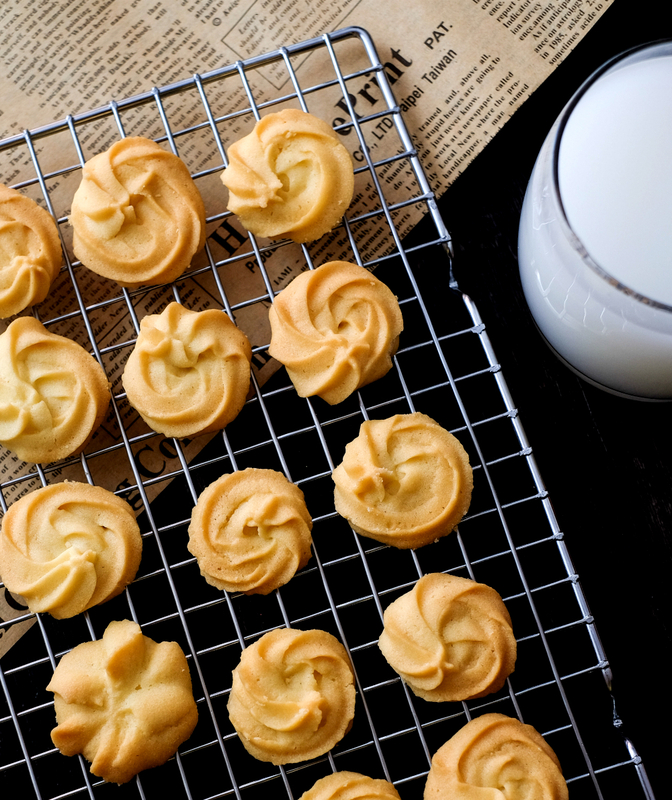 Melt in your mouth butter cookies that tastes similar to Jenny's Bakery. 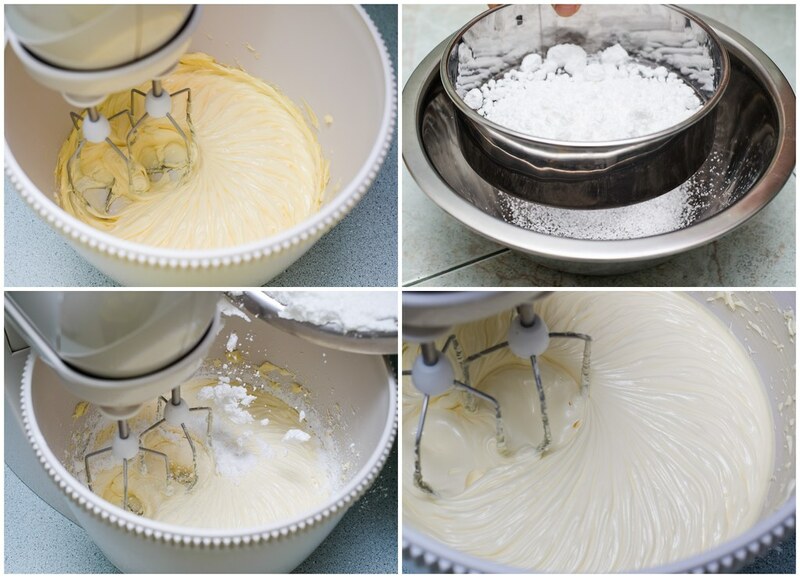 Cream butter and gradually add in the sifted icing sugar and beat till pale and fluffy. Sift plain flour, wheat flour and corn flour twice. Fold the ingredients together with a spatula until it is well incorporated. Do not beat or over mix as you will not achieve the airy texture. Put the dough into a piping bag with star dip nozzle. Pipe the cookies onto the baking tray lined with baking paper. Leave 1 cm in between cookies as they will expand a little during baking. Bake for 15-20 minutes or until the cookies turn light golden brown. Leave it to cool on a cooling rack before storing them in air-tight container. Great recipie! 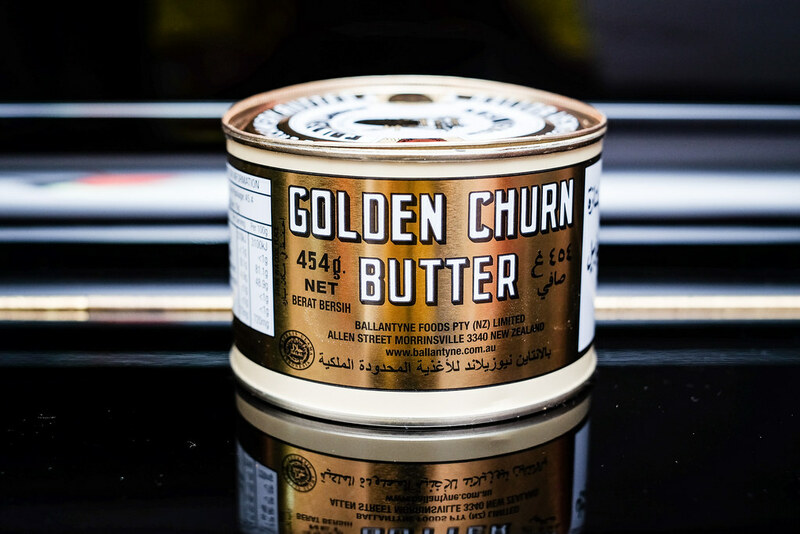 Could you share where you bought the Golden Churn tin butter? Will try this out as soon as I get my hands on it! May I know what is wheat flour? Is it the same as cake flour? Yes i think it is similar. it is soft wheat flour. Great to see tgis recipe! Thanks. You mentioned corn starch, meaning i need to get a starch? Add in at which stage? Or do you mean corn flour? Sorry, I mean corn flour. Hey babe, is all purpose flour plain flour? Hope you will try to unravel the secrets of the coffee cookies next! Hi where do you get the Golden Churn Butter. Went phoon Huat can’t find. Went cold storage and couldn’t find at the aisle either. Am I searching in wrong direction? Thank you and I had done 3 times with the 3rd receipe. Indeed it melted in mouth. I used Australian salted butter block but found it too buttery. Will try golden churn . Thanks again. Hi did u all tried this recipe works with salted or non salted butter? Have you tried making the coffee ones? Would you suggest just adding coffee powder? Do share if you’ve tried them. Thanks! Have you tried the coffee cookies? How much coffee powder I should add? Hi from the pics, you beat up the ingredients together while your step 4 proposed to fold it Which can achieve a more desirable result? i put it in the fridge as well. of course, i soften it first before using it. I just tried your recipe and it turned out so good ! Basic ingredients, simple steps, fuss free and quick turn around time ! – definitely a recipe worth keeping! – but of course the most important thing is cookies did taste very good ! Not too sweet, flavourful, crispy on the outside and melts in the mouth ! 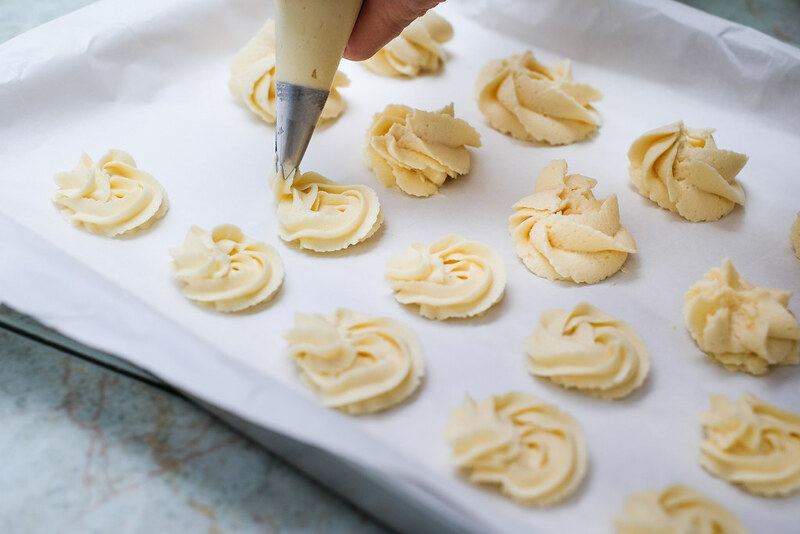 If I don’t use a piping but cookies cutter, will it affect the texture when baking? it’s quite soft, think it will be quite difficult to use a cookie cutter. My colleague gave me the recipe. Cookies turned out to be “yummy”. Wl try again putting walnut or almond next time. Thank you for sharing. Hi there, wanna ask wads the difference btw the tin butter compared to the ones in the chiller? tin butter can be used imeediately. the ones in the chiller needs to be softened. Tried the receipe. The taste was great. But while baking, I noticed the cookie spread out and the shape flattened. Wondering what’s the cause of it. Could be due to over mixing. For the last step, was told to fold in the flour gently to avoid over mixing. The cookies taste great! But I have the same problem… The cookies spread a lot and flattened while baking… Wonder why why why? Hi Thanks for sharing the recipe. I tried but my cookie spread out and flatten too. What did I do wrongly? Hi u stated 50g icing sugar is it sweet enough?? hi. any difference if use normal caster sugar instead of icing sugar? It effects texture. 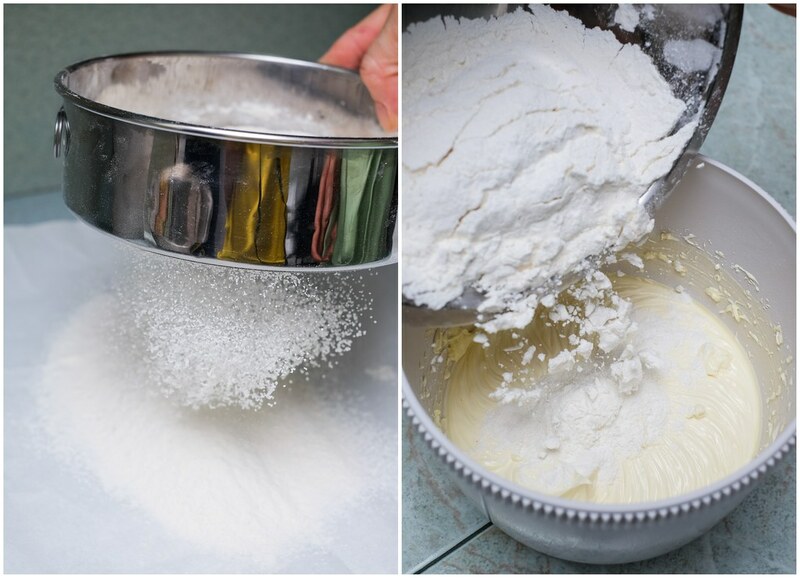 Icing sugar contains a little corn starch which will make the cookies more tender and “sandy”. Hi, may I know how many cookies you made with that size based on the recipe? Hi thanks for sharing the recipe! I used 1cm for piping.. Hmm did I missed something? Tried the recipe today and it turns out really well. The cookies kept it shape and taste very good and buttery! Great recipe! The corn four is the same as corn starch or you mean the yellow one? May checking how many cookies does this recipe make? I tried to make the cookies and they taste FANTASTIC (like the real deal)! May I know how long can the cookies last in room temperature environment? 3 days! cuz no preservatives! My cookies also spread out & flattened. How I can keep piped shape? What’s the size of the tip that u used? Texture is very good but really not sweet enough so I dusted icing sugar on top. My cookies keep collapsing. I chilled in the fridge around 15 min but it still doesn’t help. Any comments? This recipe is such a keeper! Loved the results, though I would add a little bit more sugar the next time. It yielded 30 cookies.. maybe i made them too big. Thank you for sharing!! You mentioned 2 tbsp coffee powder for coffee flavour. Is it instant coffee powder? Will let u know how mine turned out, thank you for your post! I love this recipe! Thank you for sharing. Hi Maureen. Thanks for sharing. I tried your recipe n the cookies were really good though it’s my first try. I used salted president butter n it’s a little salty. Next try I will use golden churn. Do u use salted or unsalted? Thanks. Good to hear that, June! I tried the recipe but mine didn’t turn out fluffy enough. It seems a little dry and flat. Not like yours. Can you tell me why? Hello, i dont have the golden churn butter. Can i use salted butter block instead? Thanks. Hi Maureen, u r such a generous sweetie, tks for being so humble. Have a great day. im using golden churn canned butted which is what is called for, there is no canned unsalted version butter available unless u mean the typical chilled block of unsalted butter instead of canned butter. CaN I use cake flour instead of top flour? I tried the recipe, it turn out fine. But the butter is a little salty as it is salted butter. need to get unsalted butter. The sweetness also need to be increase a little, as it overpower by the salted butter. I will do a few batches with different sweetness level to try out. Hi…Thks for sharing..look very nice! Hi Maureen, many thanks for sharing. Please could you tell me what brand of corn flour you use? Is it the Brown & Polson Corn Flour in the brown and orange/yellow tin? There’s a lot of confusion on the Internet about whether to use corn starch or corn flour because different countries call it differently. Many thanks! Tried your recipe and it was really good! My kids love them! Very close to Jenny’s. Thank you for sharing! This was a very nice recipe, too sinful! However my cookies didn’t hold their shapes well 🙁 tasted good anyway! Good. Plenty of successful comment. Can’t wait to try make this weekend! Awesome! Really melt in the mouth! My boys love it so much! I followed the recipe to a t… not so sweet, good!! The only issue I have is I’ve used the wrong tip for piping, my star is to small, very difficult to pipe. Gonna try it with a bigger star the next round! This recipe is definitely a keeper… thank you so much for sharing! Thanks for sharing this recipe, Maureen. On subsequent batches, I added lemon zest & vanilla extract after beating the butter & sugar; it was quite refreshing. Hi is the golden churn tin butter salted or unsalted ? After piping chill the cookies for 30mins before baking,it may hold the shape after baking. Can try. Don’t beat too long. I tried this recipe yesterday, very good cookies. Thanks for sharing.